“Macro photography allows us to see the world in a new light. Some of the best macro subjects may appear mundane at first — things you’d normally pass by without giving a second glance — but get just a little closer and there’s often a hidden beauty to be discovered. This entry was posted in Country Gardening, My Photos and tagged butterfly garden, coneflower, echinacea purpurea, gardening, photography, Wordpress Photography Challenge: Close-up. Bookmark the permalink. Thank you, Storm, same to you! I love the way your photo emphasizes both color and line and shading! The downward reaching petals and the upward reaching (help me out here Eliza!) pollen-things with their graduated orange to darkest green. Beautiful! Isn’t amazing what you can actually see when you use the macro, much more than your eye can capture. Lovely work, Eliza. Thank you very much, it is so true! So clear. The petals look like ribbons. Love it! It’s interesting to me how often a close-up reveals geometry. What arlingwoman says! I love seeing things through your vision. 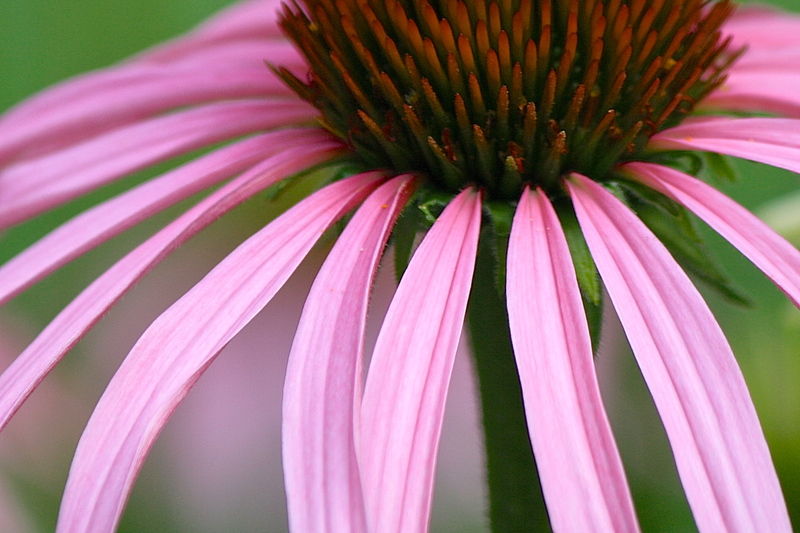 Your coneflower looks much brighter and happier than ours. Perhaps it is the difference in our climate. Also, no nibbling on your petals! Exquisite! Thank you! Believe me, this is a first to have no nibbles. I think maybe the cold winter might have knocked down a few critters. Usually, I get an ugly brown worm infestation that guts the flowerhead and covers it with brown you-know-what. Or maybe my feathered friends took care of the would-be egg layers before they got a shot at my cones. Either way, I am really enjoying them this year! Gorgeous ! So happy there is no infestation 😊Isn’t it interesting how we get different pests year to year ? A purple fountain’s majesty made more stunning because it comes from a familiar place (coneflower). Thanks, Liv. They’re looking fabulous this year! Beautiful! Such a worthy subject. I could photograph cone flowers for hours – difficult to paint. Oh, this is a stunning shot of Echinacea. I’m putting together a post on “pink”. Would you permit me to use this photo as one of the images I present with full credit back to you and your post? Thank you! You certainly may, I’d be delighted.